Important satirical map illustrating the folly of the Mississippi Bubble. Afbeeldinge van't zeer vermearde Eiland Geks-Kop. An important and charming 1720 satirical allegory map, commonly known as the 'Fools Head' or 'Fools Cap,' intended to illustrate the dangers and pitfalls of 'bubble economies.' After the bursting of the Dot-Com Bubble and the more disastrous United States Housing Bubble (and subsequent sub-prime mortgage crises) most will find the themes of this 18th century map taunting the speculators in the Mississippi Scheme - poverty, sorrow, and despair - quite familiar. The Mississippi Company (a.k.a Mississippi Scheme, or more properly, Compagnie de la Louisiane ou d'Occident) was a French joint stock company established by the Scottish financial wizard, convicted murderer, economic theorist, and gambler, John Law (1671-1729). The company was, in essence, a private bank founded with the intention of developing the resources of French Louisiana, for which they held a monopoly guarantee under the French crown. The company's optimistic propaganda captured the popular imagination and its stock value rose stratospherically, allowing Law's Mississippi Company to absorb several similar companies operating at the time, including the Compagnie des Indes Orientales and the Compagnie de Chine, ultimately rebranding itself Compagnie Perpetuelle des Indes. Law devised a scheme by which the Mississippi Company assumed and restructured the entire French national debt, launching a mechanism whereby portions of this debt could be exchanged for stock shares. Based upon the presumed limitless wealth of the Americas, the company's stock became highly coveted with some 300,000 applicants for the 50,000 shares offered. Consequently, the stock, which opened at 500 livres, quickly rose to 18,000 livres per share. When speculators began to take their profits, the company was forced to issue its own paper currency to meet the demand. This currency was presumably backed in gold by the Banque Royale, which Law effectively controlled. Nonetheless, with increased amounts of near worthless paper currency in circulation, inflation soared. Eventually, in May of 1720, the French government admitted that the paper money already in circulation far exceeded the national gold reserves. Share values plummeted as stockholders and speculators alike rushed to turn in their bills for metallic coinage. The stock markets in France, Holland, and England collapsed, leading to the bankruptcy of similar companies, such as the South Sea Company, in London and Amsterdam. Thousands of individuals, as well as many companies and even governments, fully divested of their entire net worth, resorted to bankruptcy and, in some cases, suicide. John Law, now a fugitive, fled France and died a pauper in Venice. This map, finely engraved and printed in Amsterdam, satirizes the folly and consequence of the bubble economy created by the Mississippi Scheme and its careless investors. The title, Afbeeldinge van't zeer vermearde Eiland Geks-Kop…, translates to 'Representation of the very famous island of Mad-head, lying in the sea of shares, discovered by Mr. Law-rens, and inhabited by a collection of all kinds of people, to whom are given the general name shareholders.' The center of the map is an island that takes the form of a traditional fool's head. It is situated in the 'Sea of Shares,' surrounded by the smaller islands of Armoed (‘Poverty'). Droefhyt ('Sorrow'), and Wanhoop (‘Despair'). Rivers are used to define the face, the cap, and the donkey ears, and are marked with humorous place names including Bedriegers Stadt (‘Charlatan City'), Leugenburg (‘Lie Town'), Blind Voort ('Blind Fort'), Sottenburg (‘Crazy Town'), and Bederfwyk (‘Corrupt Quarter'), among others. At the center is the city of Quinqumpoix, named after the street in Paris where John Law maintained his offices. The rivers, 'Seine,' 'Teems,' and 'Maas,' representing the Seine, the Thames, and the Meuse, are major arteries in those countries most affected by the collapse: France, England, and the Netherlands, respectively. A vignette to the left of the map illustrates angry investors storming the company's offices and, in another to the right, John Law himself flees from angry investors in the direction of Vianen on board a square-rigged land-yacht, itself another absurdity of the period. The map shares the sheet with a second plate, situated below it, that continues to satirize the Mississippi Scheme in verse. 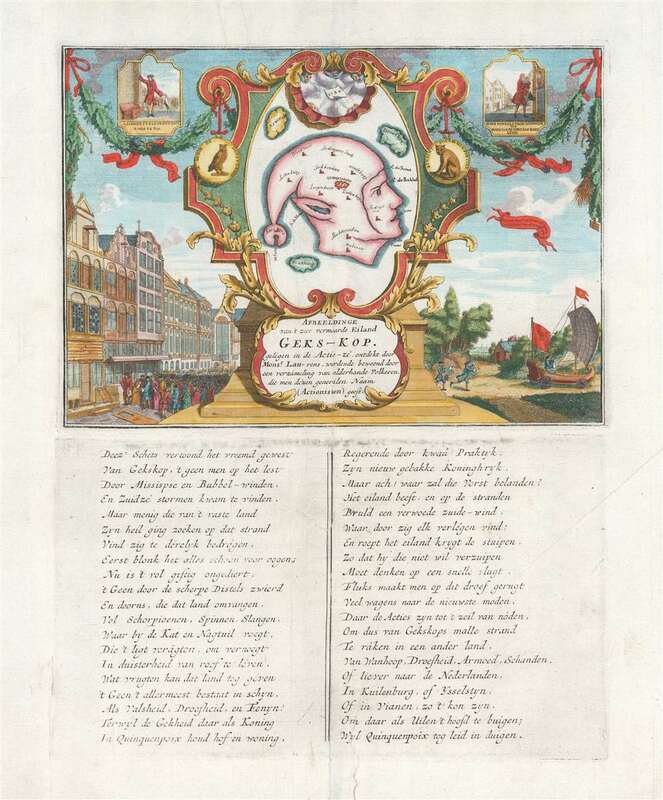 This map was issued in Het Groote Tafereel der Dwassheid… ('The Great Mirror of Folly'), a collection of images published in Amsterdam in 1720 to satirize the Mississippi Bubble. The author of this image is unknown, but it is nonetheless one of the most iconic satirical maps ever published. Het Groote Tafereel der Dwaasheid, Vertoonende de opkomst, voortgang en ondergang der Actie, Bubbel en Windnegotie, in Vrankryk, Engeland, en de Nederlanden, gepleegt in den Jaare MDCCXX, (Amsterdam: D. Onder de Linden) 1720. Good. Minor centerfold reinforcement. Repairs to upper margin far from printing. Platemark visible. Blank on verso. British Museum, Catalogue of Prints and Drawings In The British Museum. Division I Political And Personal Satires, vol.II (London, British Museum. 1873), p.541-543. Mapforum.com, no. 5. Muller, Frederik, De Nederlandsche Geschiedenis in Platen. Beredeneerde Beschrijving van Nederlandsche Historieplaten,#3592.